What’s the Stem Cells Buzz this Week? - iPSC-derived Photoreceptor Precursors, Periarticular MSCs, Endocrine Specification, and iPSC Treatment of Acute Lung Injury! New research from the lab of Majlinda Lako (Newcastle University, Newcastle upon Tyne, United Kingdom) sought to transcriptionally profile CRX‐expressing photoreceptor precursors derived from human pluripotent stem cells (hiPSCs) and test their engraftment capacity in an animal model of retinitis pigmentosa characterized by rapid photoreceptor degeneration. Collin et al. 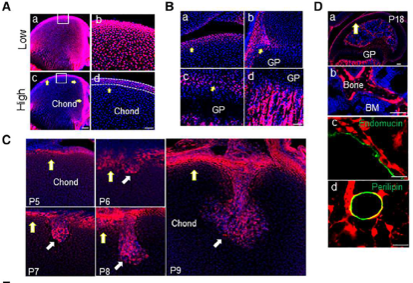 now that that photoreceptor precursors characterized by CRX expression are homogenous and committed to an early cone phenotype, while transplantation of these cells into degenerated retinae promotes the formation of connections with the host interneurons and maturation into cones. 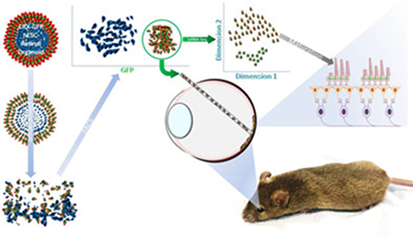 For more on how photoreceptor precursors may restore vision in degenerative models of retinal disease, see STEM CELLS now! The development of the long bones involves the embryonic formation of a primary ossification center (POC) in the diaphysis followed by postnatal development of secondary ossification centers (SOC) at each epiphysis. To understand more about SOC formation, researchers from the lab of Ling Qin (University of Pennsylvania, Philadelphia, USA) employed fluorescent reporter mice to demonstrate how a layer of highly fluorescent cells along the epiphyseal surface contain the mesenchymal stem cells (MSCs) responsible for initiating SOC formation, recruiting surrounding vessels, and establishing all mesenchymal lineage cells within this bone compartment. See STEM CELLS now for all the details! 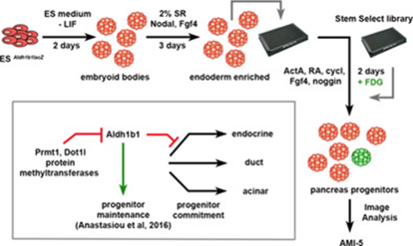 Previous studies from the lab of Anthony Gavalas (Technische Universität Dresden, Germany) discovered that loss of Aldehyde dehydrogenase 1b1 (Aldh1b1) activity accelerates differentiation of pancreatic progenitor cells and the formation of deficient β cells. The teams now return with a STEM CELLS study, in which Giannios et al. demonstrate how AMI‐5, a protein methyltransferase inhibitor, acts as an Aldh1b1 inducer that maintains Aldh1b1 expression in embryonic pancreas explants and leads to a selective reduction in endocrine specification. Overall, this new study implicates methyltransferase activity in the regulation of endocrine differentiation and establishes that methyltransferases act through specific regulators during pancreas differentiation. 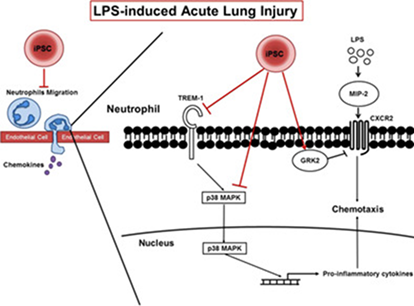 While induced pluripotent stem cells (iPSCs) can attenuate the pathological severity and neutrophil migration of lipopolysaccharide (LPS)‐induced acute lung injury (ALI), interactions between iPSCs and the triggering receptor expressed on myeloid cells (TREM) family of proteins remain unclear. Now, new research from the lab pf Kuang‐Yao Yang (National Yang‐Ming University, Taipei, Taiwan) now establishes that the administration of iPSCs reduces neutrophil infiltration by reversing LPS‐induced TREM‐1 overexpression in lung tissue and resulted in lower levels of the pro‐inflammatory cytokines, macrophage inflammatory protein‐2, tumor necrosis factor‐α, interleukin‐6, and interleukin‐1β, as well as vascular cell adhesion molecule‐1, via the p38 mitogen‐activated protein kinase signaling pathway. Discover more about this fascinating new study at STEM CELLS.